As we are getting ready for the new season we are happy to introduce three new programs starting September. We hope you will enjoy your summer and we will see your smiling faces in a couple of months. Please register to the following programs and receive $100 Off. This offer valid till September 4th, 2014. 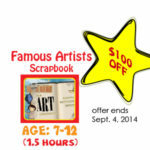 In this new program let your child’s curiosity and creativity soar while working on a handmade biographical scrapbook about famous artists. 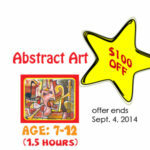 Children aged 7 and up will explore life and creations of different artists. They will be eager to learn unusual, surprising facts or stories and retell it in a creative and colorful way on the pages of their own Art Journal. The scrapbook will include dates, interesting moments, pictures, titles and, of course, a child’s artwork as a centerpiece. This class is designed to get students to think outside the box. We will start from the basics, taking a realistic image and breaking it down into abstract shapes and feelings through exercises. From those exercises we will create our final art works. We will use an array of media such as soft pastels, oil pastels, water colour and acrylic. The projects will focus on the key skills of composition, colour, use of texture to create space in an image, perspective, abstracting a theme or idea and critical analysis on a image. We will be taking examples from historical as well as contemporary artists such as Kandinsky, Jackson Pollock, Picasso, Helen Frankenthaler, and Janet Jones. This class will allow students to express their thoughts and feelings in a new way. It is a exploration into their mind. At this age their brains have high plasticity also known as neuroplasticity. This means they have the most room for growth and learning at this stage. This class will challenge and expand their thinking processes. At the end of this class their minds will be open! They will come out with a wider view on art! 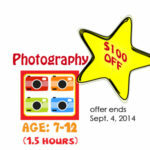 For this class you will need a camera! It does not need to be an expensive camera; you may already have a camera at home that is capable of what we will need for this class. You will need a camera that can manually change iso, shutter speed, focus, and aperture. Don’t worry if you do not have a camera with these capabilities! We will have extra cameras that can be shared with the class!